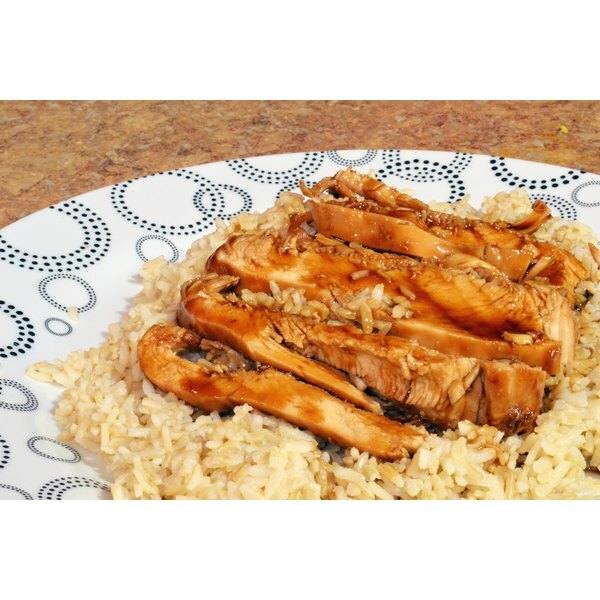 Baked teriyaki chicken is a sweet and flavorful anchor for a simple Oriental meal. Teriyaki sauce is a mix of soy sauce, sugar, molasses and sometimes bourbon or sherry. If you don’t have the time or inclination to make your own, you can get teriyaki chicken marinade in bottles at your supermarket. Foil-wrapped teriyaki chicken is tender and juicy, and using aluminum foil makes cleanup a snap. Rinse boneless, skinless chicken breasts under cool, running water. Remove any stray fat the butcher may have missed. Place the chicken breasts in a large plastic zipper bag. Fill the bag with enough teriyaki marinade to cover the chicken breasts completely. Let them soak for a few hours, or even overnight. Turn the bag over every so often to help the chicken soak up as much marinade as possible. Preheat the oven to 450 degrees Fahrenheit. Line a baking dish or cookie sheet with a piece of aluminum foil that is at least twice the size of the dish or sheet. Center the foil so that you’ll be able to wrap both sides around the chicken. Pour the chicken breasts and marinade from the plastic zipper bag into the foil-lined dish or onto the baking sheet. Arrange the chicken breasts so that they are in one layer. Fold both short sides of the foil in toward the center. Fold the long sides over the chicken, then fold them down together the way you would a lunch bag. Crimp the sides closed. Bake the chicken for 20 minutes. Open the foil package carefully so the steam doesn't burn you. Test for doneness. There should be no pink showing inside the chicken at all. If the chicken is not done, continue to bake, checking in 10-minute increments until the chicken is completely cooked. Serve teriyaki chicken with Japanese vegetables and steamed rice for a simple, exotic meal. 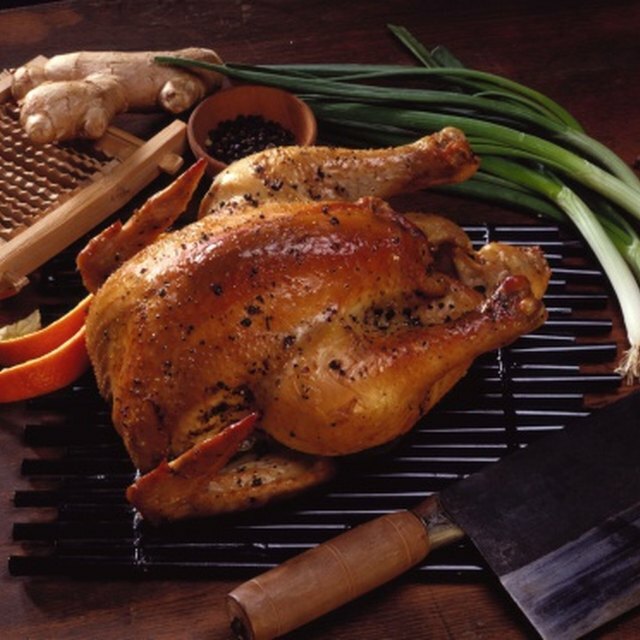 The Joy of Cooking - All About Chicken; Irma S. Rombauer et al.